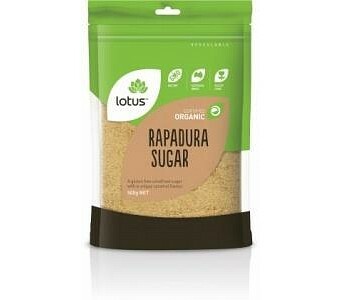 Lotus Organic Rapadura Sugar is a gluten free, unrefined sugar with a unique caramel flavour. Rapadura Sugar is the dried whole natural juice of the sugar cane. Unlike other sugar, Rapadura sugar is never seperated from its molasses content, thus it retains all the vitamins and minerals available from sugar cane. Ingredients: Rapadura Sugar.